Automated Inventory Systems was formed in 2007 to serve the inventory control needs of businesses everywhere and to reduce the organizations’ costs in the process. AIS has its headquarters located in Kearneysville, WV. 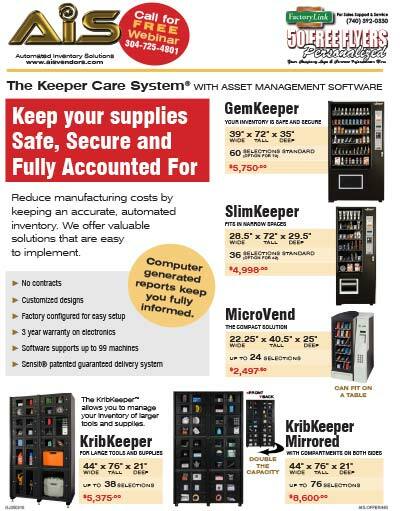 Using swipe-card, barcode or keypad technology, AIS is helping companies maintain cost-reducing control over their valuable and expensive property through state-of-the-art vending technology. The inventories of tools, equipment and supplies can now be monitored to ensure secure tracking of all items. Users of company property can now be held accountable for that property. These new vendors are known as The Keepers.